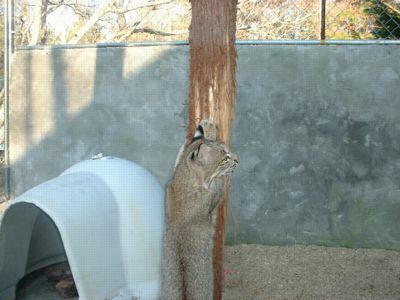 Scottish Big Cats mascot, Exmoor the bobcat, giving a demonstration of what a cat scratching post looks like. Exmoor at her scratching post. Note that it has taken her several months to scratch this amount of bark. Exmoor scratches a convenient tree trunk, watched with interest by her friend the Prarie dog, while Panther pretends not to notice. 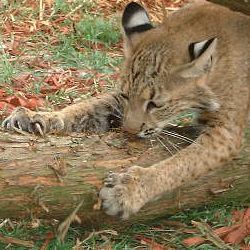 Detail of Exmoor's unsheathed claws as she scratches. Chris Smith, Scottish Big Cats. 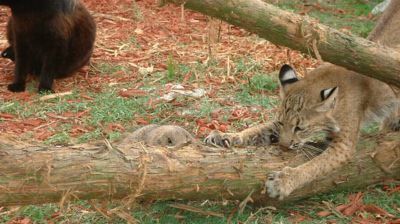 Keepers at Longleat Safari Park have created a giant scratch post fit for kings of the jungle. The attraction's pride of lions have been given the huge toy to play with to stop their mighty paws wrecking ancient oak trees on the Wiltshire estate. The four-metre tall post, which is wrapped in 80 metres of thick rope, has also been soaked in pungent catnip to attract the big cats. The post, created by the keepers at the park, is a large version of those used by domestic cats - but is set seven metres deep in the ground to make sure the quarter-of-a-tonne animals don't knock it over. The safari park, in 9,000 acres of woods and parkland, is owned by Lord Bath and is home to tens of thousands of trees, many of them planted for the first Marquess of Bath by Victorian landscape artist Capability Brown. Deputy head keeper Ian Turner said: "In the safari park's East African game reserve some of the trees are over a thousand years old. "We've managed to protect them from the unwanted attentions of the giraffe and zebra by ringing them with fences, but it's not quite as traightforward with the lions. "Although none of the trees in Lion Country are that old, there are several oaks which are at least 200 to 250 years old." The seven adult lions in the Longleat pride scratch the trees to keep their claws sharp and to mark out their territory. Mr Turner said: "The post is basically a scaled-up version of the scratch posts you see for sale in pet shops around the country. "The only difference is ours is 12-feet tall, needs to be able to withstand the attentions of a quarter-of-a-tonne lion and doesn't have any of those pink, fluffy balls hanging off it." He said the lions did not know what to make of the post at first, but has since proved a big hit with them. He said most of the trees have survived since the park opened in 1966, but they wanted to offer them some respite from the animals' attentions.